1) Outside cut between 3 and the sideline* then cut to the corner. 2) Fake an on-ball screen and cut to the corner. 3) Slice between 3 and 5 to the corner. 4) Cut to the basket and go behind 5 to the corner. * Note: 1 looks for a handoff. If it occurs, 1 drives to the basket. Positions filled after 1st pass. 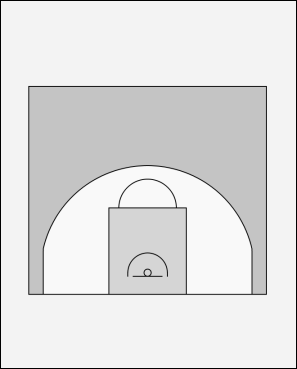 b) Weak Wing, 4, back screens 2 who fills to the corner. 1 relocates to Point Spot. b) Cutting baseline to the corner. 2 relocates to fill vacant Weak Wing Spot. 1 moves across to the Point Spot. On 1st pass from 1 to 3, the Mid Post, 5, pops-out to the corner. Then, either 1, 2 or 4 will cut to the Mid Post and post-up depending on which player we think has a miss-match. The other players balance out as shown previously. Positions filled after 1st pass and Strong Side Guard, 1, has filled the Mid Post.